Mine seals with a light press fit as the rubber seals go into the new tube. The pressure is "normal" for inserting / removing a dipstick. I think you know that the rubber seals go inside the dip stick tube. I'll take a picture of the dip stick tube, with the stick inserted and with it just out. Give me a few minutes. Arguing with an engineer is like wrestling with a pig in mud....After a while you realize they like it. I hope these help. The tube does get wider at the top, to accomodate the rubber seals. Actually, I lied earlier....Both photos show the rubber seals OUT of the dipstick tube. Normally the bottom of the large rubber "stopper" above the seals sits flush to the dipstick tube top. Wait just one second. This is completely ludacris. I can not beleive there has ever been a california spec ANYTHING that's an improvement to ours or any other sports car pedigree! That is a really great idea! Definately gonna give this ago when I get my new fluids in. Amazing write up too! Are you saying that your pics show the dipstick sticking out, as in out of position? I hope so. I would expect the big donut before the yellow handle to be the only rubber outside the tube, which is what Joe is describing, I think. Could you please clarify or post a pic with the disptick in the fully inserted position, if it's different from what is already posted? You're correct. i edited my original post to indicate that the dipstick is NOT in it's normal (running) position in the two photos. I believe your original question was : is the dipstick tube bigger in diameter at the tube's top? Yes, the dipstick tup does increase in diameter, as both photos show. 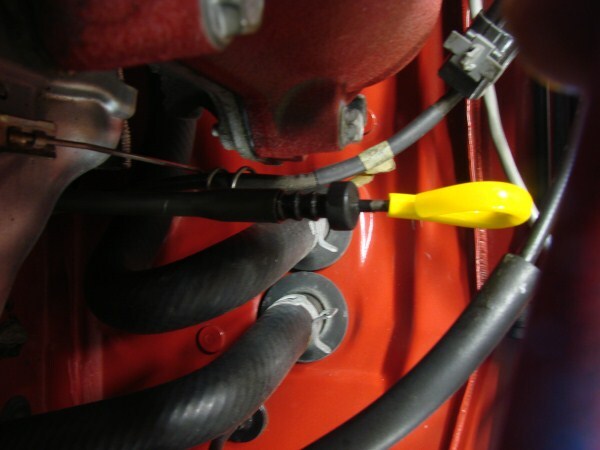 Also, the large rubber stopper "donut" , above the three smaller seals which fit inside the dipstick tube, is shown above its normal (running) position. The stopper (donut) normally sits flush to the top of the dipstick tube. The intent of my photos was to show the relation between the lower tube diameter, the upper tube diameter, the three small tube seals, and the large rubber stopper (donut). If this doesn't clarify, I'll post another photo, with the dipstick inserted fully into the dipstick tube. Let me know either way. I'll have to speak to bill as my tube doesn't seem to flare out that way. Glad the photos helped. Let us know the outcome. I hear the new dipstick is stainless steel wire with the shiny end for reading. I was wondering if the dipstick is like the stainless steel "rope" like used for clothes lines etc. If so, how stiff is the dipstick. Is it like a like trying to stick a limp noodle into a small hole? I'd like it to be stiff enough so I wouldn't have to not hold the oily end to feed it into the tube. Also, how is the wire connected at both ends? Can I feel comfortable that the connections won't separate in a few years time in the greasy vibrating environment of the engine? 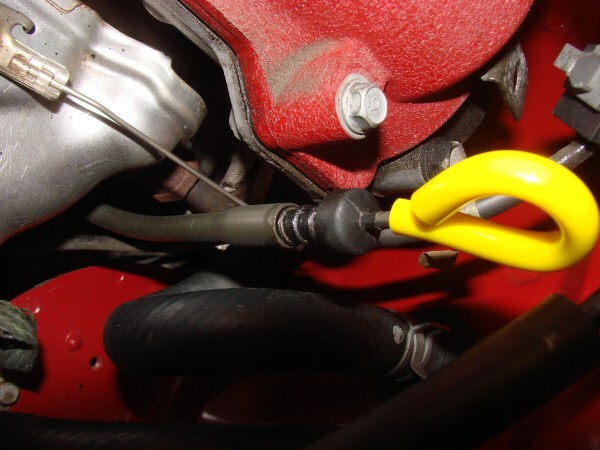 Brian: The steel cable is stiff enough that it acts like a "normal" dipstick. It doesn't wave around in the breeze nor is it difficult to reinsert. I don't have any data on the competency of the cable connections at either end other than to note that mine has been in use for roughly a year, at approximately 600 miles per week, with no issues, AND it is a Mazda factory part for this engine. Thanks for the quick reply. It makes me feel better that it's stiff enough to return it to the dipstick tube with just one hand. I just ordered the Cali Dipstick. Has anyone with this part noticed that it seems to read a little high compared to what you would think it should read? So bummed... I never followed up with Bill on this until today and he tells me that the CA tubes are now discontinued. Ok, so installed the new dip stick, have 4 fresh quarts of oil and the dip stick only reads half? What gives? If this is a direct replacement you'd think it should read full? Thoughts?